Good morning! Michigan State interim president John Engler, the state's former governor, has resigned amid backlash over his comments about Larry Nassar's sexual assault victims enjoying the "spotlight." The European Tour returned from its winter break this week, with the Abu Dhabi HSBC Championship currently underway on this spectacular-looking course. The tournament is part of the Rolex Series, a collection of 8 premier events designed to attract the biggest names in golf by offering significant prize money (upwards of $7 million per tournament). That seems to be working, as Brooks Koepka, Dustin Johnson and 13 other top-50 players are participants this week. The big picture: Abu Dhabi is the first of 6 events that will take place in the Middle East this year — a whopping 12.5% of the European Tour's schedule (48 events total). The other 5 locations: Dubai, UAE (twice) — King Abdullah Economic City, Saudi Arabia — Doha, Qatar — Muscat, Oman. How we got here: 30 years ago, Dubai was "just starting to introduce itself as a tourist destination, and golf offered a natural fit with its winter sunshine and miles of undeveloped acreage," writes the New York Times' Jeff Shain. The European Tour happened to be looking to expand at this time, so they decided to take a chance on the "oasis in the desert" — and it worked. 3 decades later, Dubai and its Middle East neighbors have hosted 64 Tour events — many of them drawing some of the world's top players on an annual basis. The NBA's 9th annual London game takes place tonight between the Washington Wizards (18-26) and New York Knicks (10-33). Tip-off is 3 pm ET on NBA TV, making this the perfect opportunity to test out your strategy for stealthily watching basketball at your desk. Consider it a dress rehearsal for March Madness. 🎥 Last night: James Harden scored 50+ points for the second straight game, but the Rockets fell to the Nets in OT thanks to Spencer Dinwiddie's heroics. Also: Steph Curry (41 pts) went off against the Pelicans, the Celtics beat the Raptors (Irving: 27 pts, 18 ast), and more. Full scoreboard. Rob Friedman, a volunteer high school pitching coach in Atlanta, just launched a new service called FlatGround designed to help under-the-radar pitchers develop and gain exposure, writes Axios' Mike Sykes. Friedman is well known in the baseball community for his "Pitching Ninja" Twitter account, which features a steady stream of video and discussion. FlatGround is Twitter-based, too, but a website and app are on the way. Why it matters: Unless they're lighting up the radar gun, talented high school and amateur pitchers often slip through the cracks. Even the ones who do throw gas struggle getting eyeballs — especially when compared to, say, a teenage hooper whose dunk just went viral. Between the lines: So far, FlatGround is delivering on what it promised, as 2 of the independent league pitchers Friedman showcased have already been signed — one by the Milwaukee Brewers and one by the Baltimore Orioles. And then there's Preston Orr, a high school senior from Dallas. After years of (unsuccessfully) trying to get recruited, retweets from the FlatGround and Pitching Ninja accounts resulted in 20 schools contacting him, 12 asking him to visit and 2 offering him a partial scholarship. The big picture: Gone are the days of athletes mailing out their highlight tapes and hoping for a call back. Now, services like FlatGround are harnessing the power of social media to offer an eyeball guarantee. If you wanted to reach hundreds of coaches and scouts a decade ago, you'd run out of envelopes. Now, all it takes is a single tweet (or retweet) from Friedman to get you on their radar — no postage stamps required. 👋 Bob Costas' 40-year career at NBC Sports is officially over as the two sides have agreed to "quietly" and "happily" break up. Costas, 66, will continue on the MLB Network, where he'll call about 20 games. He's also exploring the idea of doing a sports/news interview-style show because we don't have enough of those already. 🏈 As reported earlier this month, NFL TV ratings rose 5% this season, which sounds like great news. Growth!!! Dig deeper, though, and what you find is that the league's total "reach" actually decreased by 5 million people, meaning viewership didn't actually grow. Ratings increased solely because those who did watch the NFL watched more of it. Still a win, but not as big of one. 📖 I've always been fascinated by the relationships between athletes/coaches and the local beat reporters who cover them, which is why I enjoyed the following article so much. Read: 10-time Connecticut sports writer of the Year Jeff Jacobs spent much of his career covering Jim Calhoun at UConn. Now, they meet again — under vastly different circumstances. Worthy of your time. 24 years ago today, the Los Angeles Rams formally announced their intention to relocate to St. Louis. The league's owners initially disapproved, but the threat of a $2.25 billion lawsuit changed their minds. Fast forward: The Rams, who moved back to L.A. in 2016, play the Saints in the NFC Championship Game this Sunday. A win would send the franchise to the Super Bowl, which they last won in 1999 (remember this?). "A generation of quarterbacks are performing at such a high level into their late 30s and, in some cases, early 40s, that they're challenging our notions about longevity and team-building," writes The Ringer's Kevin Clark. Leading the way are Tom Brady (41) and Drew Brees (40), who would be the oldest QB pairing in playoff history if their teams make it to the Super Bowl — breaking a record set just last week when Brady bested Philip Rivers (37). What's happening: According to former NFL QB Matt Hasselbeck, who played for the Colts in 2015 at age 40, the league's new rules governing contact are a game-changer. "On Monday mornings [at age 40], I felt like I did when I was 26," Hasselbeck told The Ringer. "But it's just one hit. It doesn't matter if it's 'I got sacked five times versus one time,' it's 'did you get that one hit?'" 'That 'one hit' ... is the kind of contact the NFL has largely succeeded in eradicating by changing the rules in 2018," writes Clark. Add in developments in sports science, new practice limitations and a myriad of other factors and it's no wonder the QB aging curve has been permanently altered. Across the 4 major North American pro sports leagues (MLB, NBA, NFL, NHL), 6 teams share the same name. Question: Can you name all 6 team names that are shared? Hint: I'll give you one... Kings (Los Angeles and Sacramento). 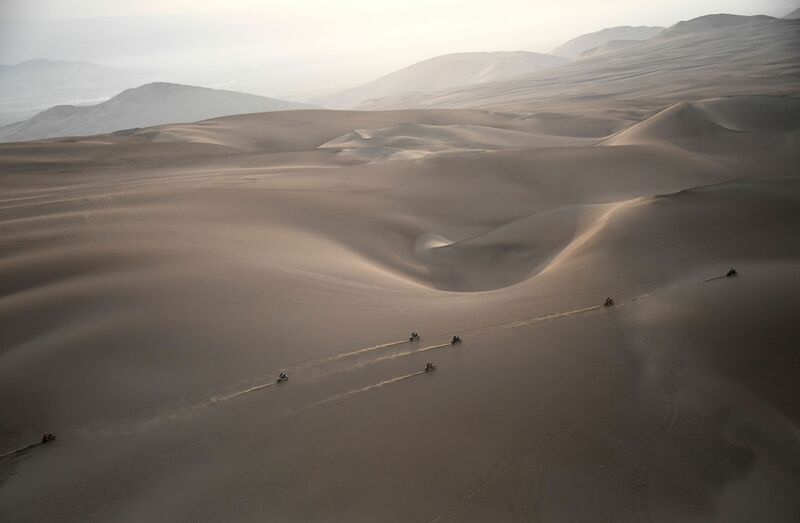 The Dakar Rally is an annual 10-day, 3,000-mile off-road endurance event, which is being held exclusively in Peru this year after neighboring countries backed out. 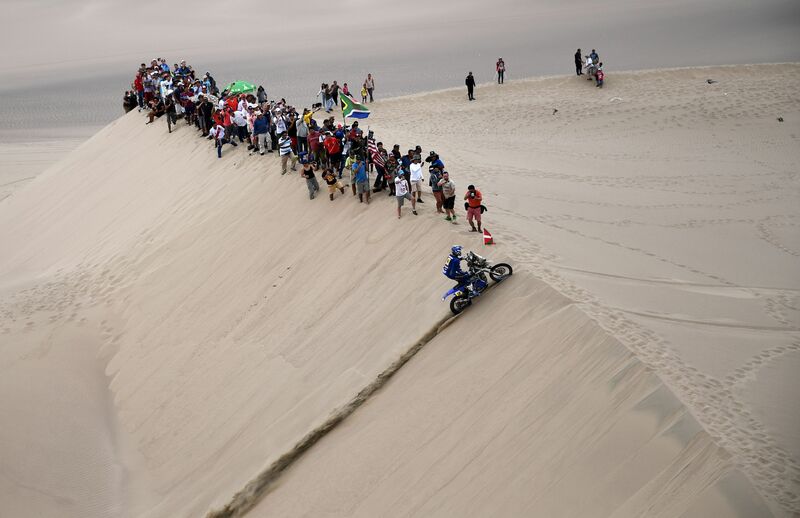 Some 334 professional and amateur competitors — operating everything from specialized trucks to quad bikes — will complete the 10th and final stage in Lima today. 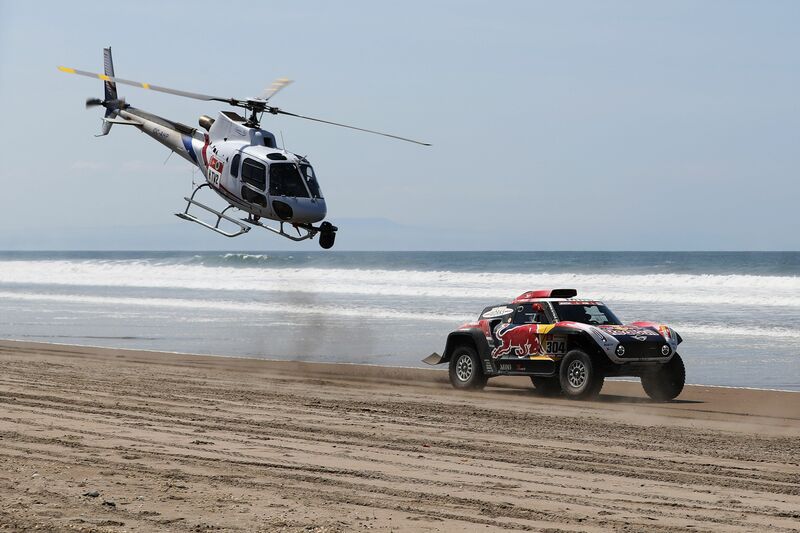 The backdrop: First staged in 1978, the Dakar Rally originally took place between Paris, France and Dakar, Senegal — but due to security threats in Northwest Africa, the race was moved to South America in 2009. In time, we all turn into our parents.